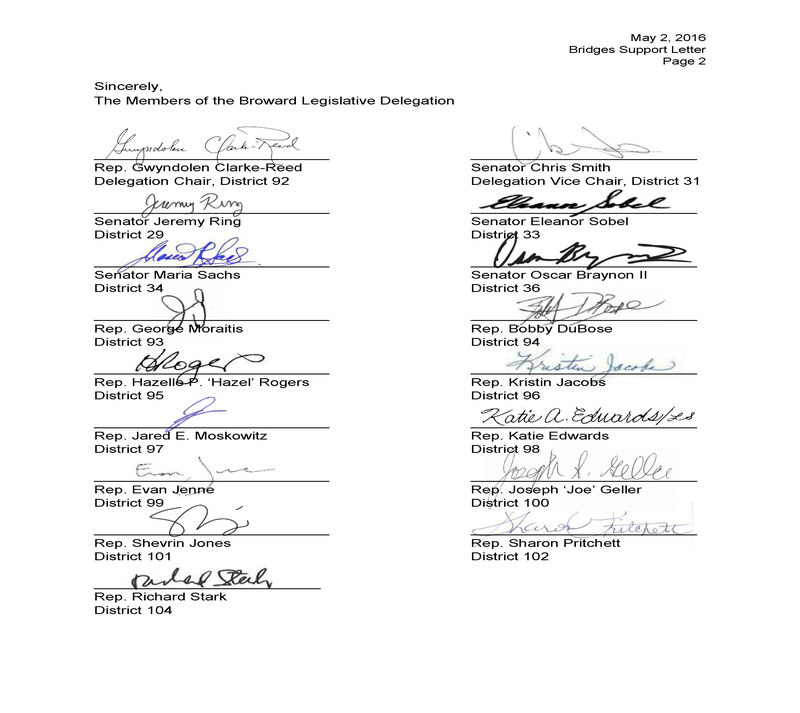 Almost all of Broward County’s legislative delegation is telling Gov. Rick Scott: Keep the Bridge open. In a new letter, 17 of the county’s members in the House and Senate — 16 of them Democrats — are the latest lawmakers to protest the Department of Corrections’ planned shutdown of a prisoner re-entry program. 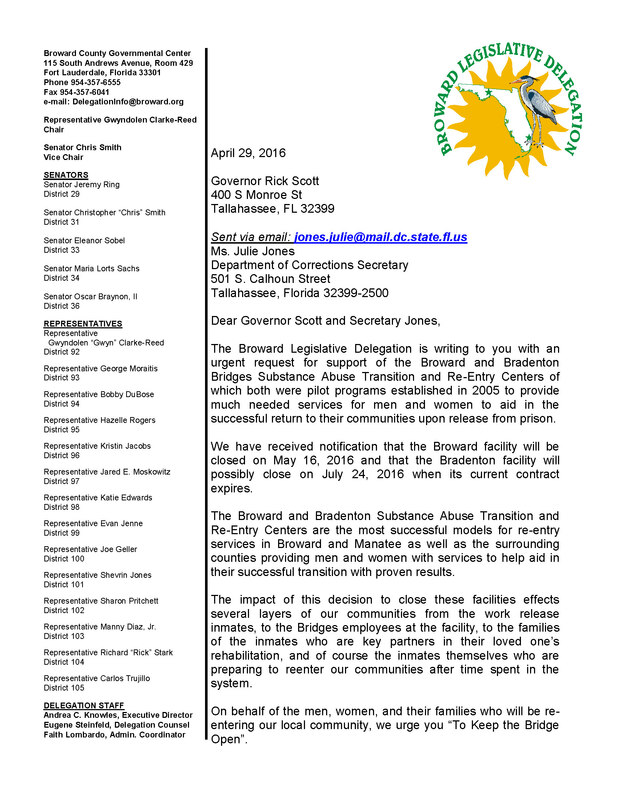 “The impact of this decision … affects several layers of our communities, from the work release inmates, to the Bridges employees at the facility, to the families of the inmates who are key partners in their loved one’s rehabilitation, and of course, the inmates themselves who are preparing to re-enter our communities after time spent in the system,” said their letter, released to news media on Wednesday. “On behalf of the men, women, and their families who will be re-entering our local community, we urge you to ‘Keep the Bridge Open,’ ” they wrote. The state is closing Broward Bridge, a residential program offering transitional counseling, drug treatment and other services to inmates on work release. Bridges of America, the Orlando-based nonprofit that runs the program, has been waging a PR battle to keep the facility open. The department told the organization it was letting the Broward contract with Bridges of America end on the May 16 expiration date and not renewing it. The agency says it needs the program’s space for more DOC employee offices. Rep. Richard Stark, a Weston Democrat. Two delegation members did not sign the letter: state Reps. Manny Diaz Jr., a Hialeah Republican, and Carlos Trujillo, a Miami Republican. Trujillo could not be reached. His voicemail was full as of Wednesday morning. Diaz said he wasn’t aware of the letter and does not yet know enough about the issue. Other lawmakers publicly opposing the shutdown include state Sen. Darren Soto, an Orlando Democrat, and House Republican Leader Dana Young of Tampa. On Monday, state Sen. Greg Evers, a Baker Republican whose Criminal Justice Committee oversees state prisons, said DOC officials had “lied” to him after promising they wouldn’t interfere with such programs. Corrections Secretary Julie Jones has said her agency “will continue in its commitment to our inmates to provide services that ensure a successful transition into Florida’s communities” but she has not backed down on the program’s closure.